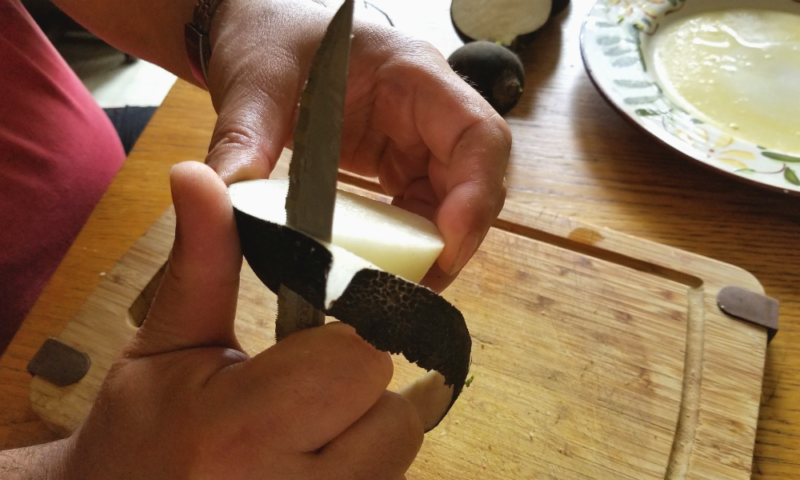 Black Radish - Travel, Shop, Cook, Have Fun! 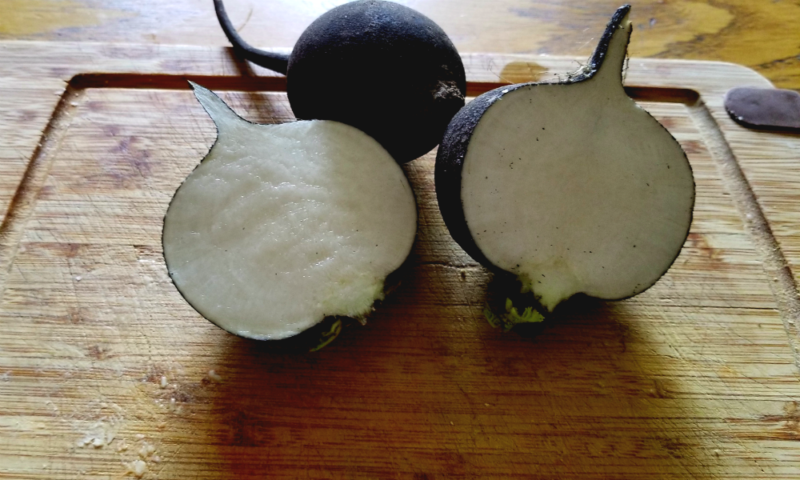 Black radish (Latin: Raphanus sativus L. var. niger) is, unfortunately, a rare guest on the markets. This root vegetable with a black skin and white flesh is one of the oldest of its kind, used throughout Asia, Europe and Africa. It contains high amounts of dietary fibre and vitamin C, as well as moderate levels of iron, magnesium, potassium, and other key vitamins, such as vitamins B, A, and E. This vegetable is also very low in calories, with only 10 calories in a 3-ounce serving. 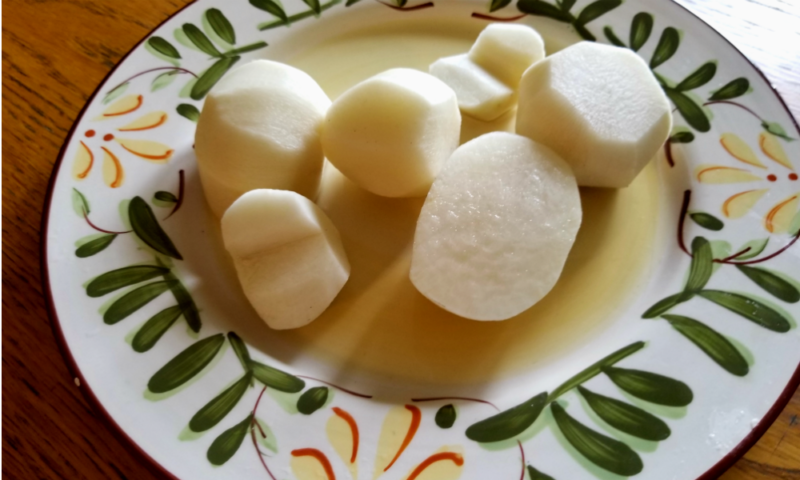 In China and Europe, black radish root has been used in folk medicine as gallbladder tonic and as a natural remedy for impaired bile function and digestive problems. 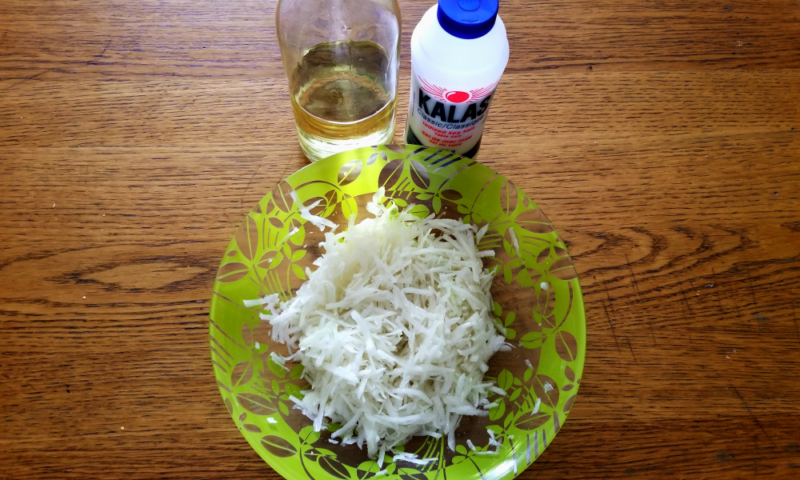 In Eastern Europe, it’s also been used to cure hair fallout or brittle hair. Black radish juice mixed with honey is still very popular in Ukraine as a cough and cold medicine. When used for culinary purposes, the black skin is removed, and the white inner flesh is steamed, sautéed, or stir-fried. 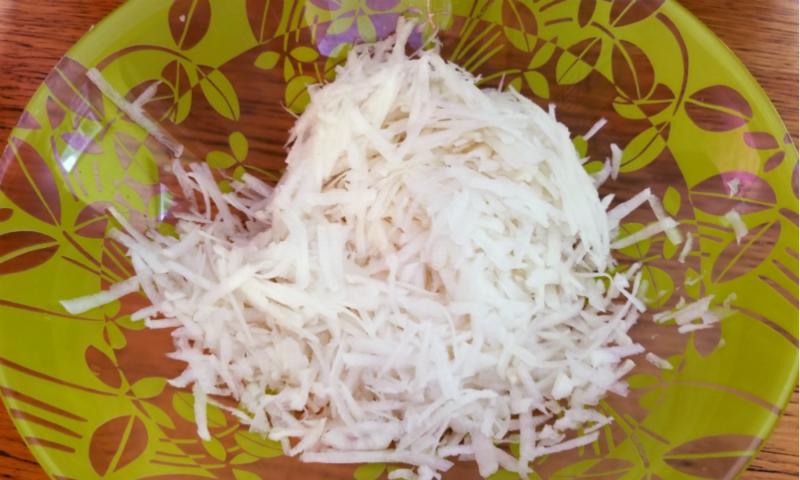 You can roast them, pickle them, mash them with sour cream or cream cheese, or eat them raw, grated or sliced, and added to salads. We prefer to eat them raw. First, we would wash the roots and peel off the skin. 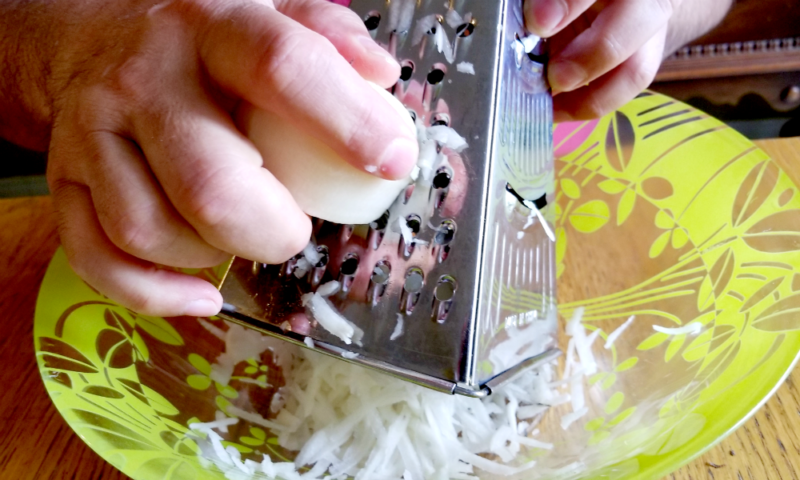 Then, we would grate them on a grater with big holes, chop a small onion and mix it with grated radish. Add salt and sunflower or olive oil and voila! 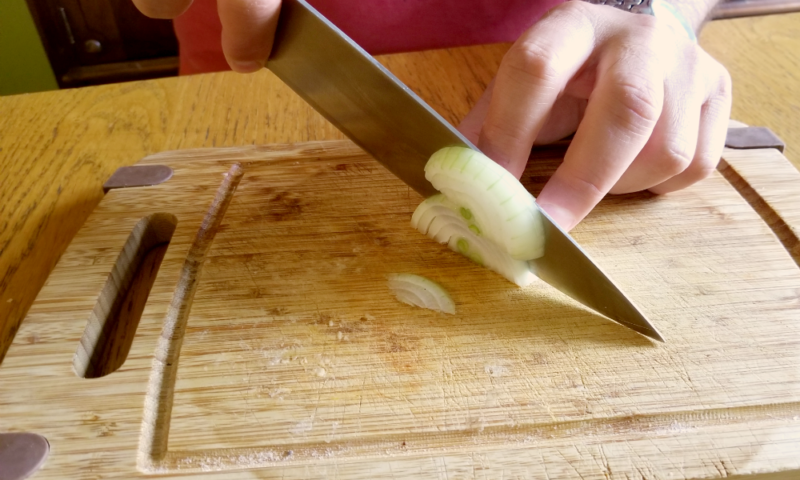 A delicious and nutritious dish is ready. 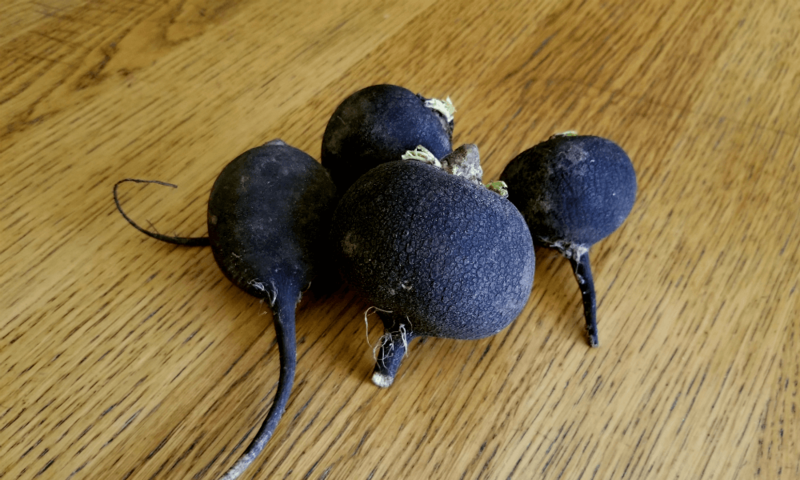 Two weeks ago we were lucky to buy a few perfect roots at Uxbridge Farmer’s Market and we noticed that people do not know much about black radish. 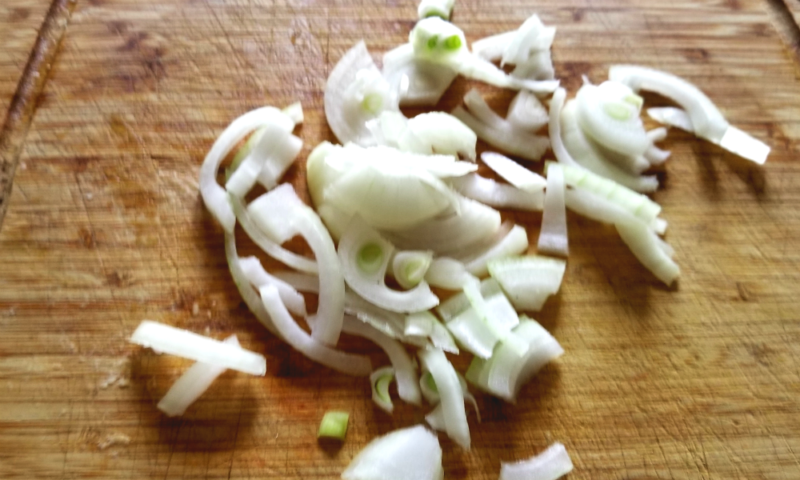 So we decided to write this ode to restore the reputation of this unfairly forgotten magic vegetable.